Eklingji Temple Udaipur: Eklingji temple is located at a distance of about 22 km from Udaipur. Dedicated to Lord Shiva, a Hindu deity held in high regard by the kings of Mewar, the Eklingji Temple is believed to have been founded by Acharya Vishwaroop. The sprawling temple stretches over 2500 sq feet area and towers to a height of 65 feet. The temple has ramparts protecting it and is built of sandstone and marble, both indigenously available materials. 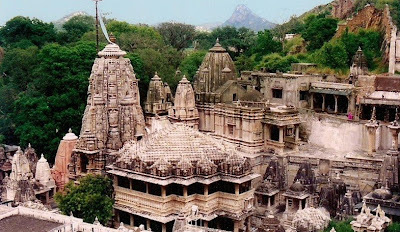 Begun in 971, the temple complex was built by the Guhila (later called Sesodia) dynasty of Mewar, in honor of their presiding deity Eklingji, a form of Lord Shiva. The beautifully sculpted temple complex includes 108 temples within its high walls. The main temple, which dates to the 15th century, was rebuilt from the ruins of an earlier destroyed temple. The walled complex is made of marble and granite and has an enormous double-storied, elaborately pillared hall or "mandap" under a vast pyramidal roof, with a four-faced image of Lord Shiva in black marble. Another temple in the complex is the Lakulish Temple; built in 971, it is the only temple of the Lakulish sect in the whole of India.